As per the Motor Vehicles Act, it is mandatory for every car owner to insure his or her vehicle with at least a third-party liability cover. Car insurance, be it comprehensive or third-party liability cover financially protects you and your car from liabilities towards damage, loss or injury incurred as a result of mishap. 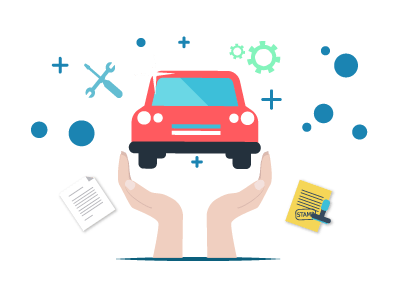 A comprehensive car insurance policy protects you from third-party liabilities and own damage liabilities while a third-party liability insurance plan covers third-party liabilities alone. What is an IDV (Insured Declared Value)? Insured Declared Value is the market value of your car at any given point in time after taking the depreciation factor of the vehicle into account. The insurer decides on the claim amount to be disbursed to the policyholder based on the vehicle's IDV, hence it is also the maximum claim amount that the policyholder receives at the time of claim settlement. The Insured Declared Value is calculated based on the geographical location, selling price of the vehicle, make and model of the car, etc. as mentioned above. IDV is inversely proportional to the age of the vehicle; as the age of the vehicle increases, the IDV of the vehicle will decrease. When the insurer determines the IDV of the vehicle based on the current selling price of the vehicle rather than the amount you paid to purchase the vehicle. The additional parts fitted in your car is also taken into consideration at the time of calculating the vehicle’s IDV. For vehicles that are above 5 years old, the IDV is calculated based on the vehicle's condition. The insurer and the policyholder will discuss and come to a mutual agreement regarding the IDV for a vehicle older than 5 years. The condition of the car, age of the car, total miles travelled, etc. are some of the factors that determine the IDV of the car. It is vital to know that a vehicle’s IDV decreases if the age of the car increases. Hence, taking a car insurance for a vehicle that is older than 5 years is not advisable. Sometimes people opt for a higher or lower IDV that the actual invoice cost at the time of car insurance purchase. The main reason behind declaring a lower IDV than the original cost of the car is for lowering the insurance premium that need to be paid. In case of a mishap, if one has opted for a lower IDV, one would have to spend more on the liabilities that are not covered by the insurance claim. There are also times when the policyholder declares a higher IDV than the actual cost of the vehicle at the time of policy purchase. At the time of claim settlement, even if you have declared a higher IDV, due to the vehicle’s age and the rate of depreciation one would get a lower claim amount. Insured Declared Value plays a vital role in deciding the insured amount one should receive at the time of claim settlement.